The sale and purchase of domain names has been a lucrative trade ever since the dot com bubble. Ordinarily, you can get a .com domain from GoDaddy for just $10. But there are people who rake in bucks by buying, and then selling big, valuable domain names. 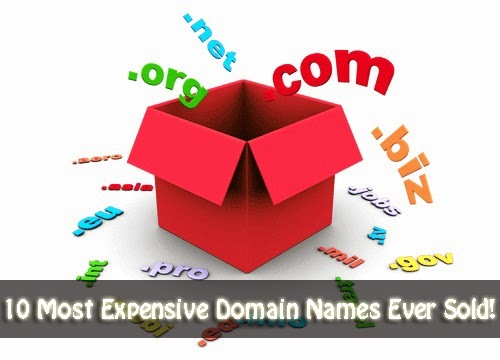 Here is a list of the top 10 most expensive domain names ever sold. Only those domain names are listed which were sold purely as domain names i.e. only the domain name was the part of the deal, and not the website itself. Insure.com was purchased by QuinStreet, an online marketing services and technology company. It is the single largest domain name ever sold. It was originally acquired by Insure.com for $1.6 million in December 2001. The website now provides life, car and health insurance quotes among others. fund.com is owned by “Gentile, Philip “. Gentile, Philip bought this domain for £9.9 million in March 2008, which amounted to about $14.9 Million. However, this domain is not yet live. This domain was purchased by Facebook, Inc. on September 2010 for $8.5 million. Currently this domain redirects to Facebook.com. Facebook purchased this domain from American Farm Bureau Federation. It is a business search engine and web directory founded in 1999 by Jake Winebaum, former chairman of the Walt Disney Internet Group. In July 2007 business.com, the company, was sold to Yellow Pages publisher RH Donnelly for $345 million. Although priced the same as business.com, this domain was purchased more than 7 years later in 2006, hence making it a slightly lower-value purchase (due to the depreciation of the dollar over time). It was bought by online jewellery retailer ice.com, and is quite simply an online diamond jewellery store. Beer.com was purchased by Thought Convergence, LLC in Jan 2004 for” $7 million”. This domain is also currently not in use for any purpose. Billed as "your first and best source for information about Israel". It was bought in 1994 by Joel Noel Friedman, a 46-year-old Jewish American. Rather than seek profit, he originally bought the site in fear that it would be misused by somebody else. casino.com was purchased by Mansion Limited of Gibraltar in November 2003 for $5.5 million. As the name suggests, this website hosts several online gambling games. slots.com was purchased by ”Bodog Media” in June 2010 for “$5.5 million”. This website also hosts several online gambling and slot games. Purchased in March 2009 for $5.1 Million by ToysRUs, a leading toy and video game company. Surely, this domain’s price is nothing as compared to the revenue that is being generated from it. Note: For family-safety, adult domain names have not been included in this list. That was so expensive domain name.,,thanks for the info. Really Nice work and usefull info about domains, keep it up ! It is good to know about this information and thanks for sharing. You guys are doing a great job here at My Blogger Tricks. pretty crazy! especially since some aren't even being used! Thanks for sharing useful information about domain names . Many of the domain registrars provides domain to the customers at cheap cost .